Print Book 530 pages in 1 volume (printed book) with downloadable forms Note: For print books, with MCLE's supplementation service, new supplements and revisions are mailed automatically with an invoice. If you do not want to subscribe, please check the opt out option during checkout. 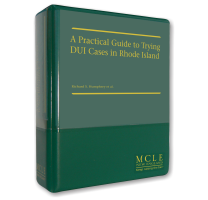 Designed specifically for lawyers who defend and prosecute drunk driving cases in Rhode Island, A Practical Guide to Trying DUI Cases in Rhode Island is a first for the State of Rhode Island. Editor Richard S. Humphrey, Esq. of Tiverton, RI has assembled a winning cadre of DUI experts to join him in developing this must-have resource, which offers practical, seasoned guidance backed by case law and statutory authorities. A Practical Guide to Trying DUI Cases in Rhode Island has been tailored to serve as a practice resource for both Rhode Island prosecutors and defense counsel. Featured are sample jury instructions, a checklist of motions, cresting case law and sample pleadings, as well as key citations to statutes and regulations. Use this book as a reference resource when preparing for your first - or next - DUI case in Rhode Island.